As cliché as it may have been, there is a lot of truth to the saying. Healthy foods have profound healing powers, while unhealthy foods wreak havoc on our bodies. It all seems simple enough, right? Despite what we know through modern science about nutrition, though, many of us still don’t get all the proper nutrients that we need to stay healthy and balanced and keep disease away. For many of us, it can be very difficult to consistently get everything the body needs through what we eat on a daily basis; even if we eat a nutrient-dense diet. This is often due to potential imbalances in our food choices. In this article, I want to share with you the “Fit 6” most essential, scientifically-backed natural supplements that can help you optimize your nutritional foundation and keep your body running smoothly for life. Here are some of my top daily picks. The best way to ensure proper nutrition is through a well-balanced diet. But for those who fear they may be falling short of recommended daily nutrient levels, a study published in Nutrition Journal analyzed men and women over the age of 65 and found that the use of a multivitamin reduced the risk of certain micronutrient deficiencies and also aided in improving cognitive functioning in some of the group’s subsets, including those people past the age of 75. Since multivitamins typically contain ample amounts of B-complex vitamins and vitamin C, studies have shown that daily multivitamin usage can significantly improve energy levels; particularly for those who have vitamins B and C deficiencies. In fact, students at colleges such as Arizona State University are even encouraged by the school’s wellness office to take a multivitamin every day to keep their energy levels up and to allow them to respond more positively to the numerous stressors that come with college life. When selecting the right multivitamin for you, make sure you read the label carefully and pick one that gives you 100% of the Daily Value (DV) for most of the vitamins and minerals that it contains. Also, consider picking a multivitamin that is designed and formulated for your age, gender and lifestyle so that the nutrients are ideal for your particular needs. For most people, Metagenics’ PhytoMulti and Pure Encapsulations’ PureGenomics are great, comprehensive choices. Vitamin D is also important because it does a lot more than build healthy bones and is truly not something in which people should be deficient. It is critical for the immune system and for helping fight an array of chronic diseases including cardiovascular disease. According to the Annuls of Epidemiology, supplementing with vitamin D3 has the potential to reduce cancer deaths in America by 75%. Most Americans have lower vitamin D levels than they should, especially in the winter months, and supplementation is necessary for many. Thorne Research’s Vitamin D products, D-5000, D-10,000, and D-25,000 are excellent choices depending on whether you are looking just to maintain your vitamin D levels or build them back up through higher doses. Thorne’s Vitamin D/K2 Liquid is also a popular choice. For a more in-depth review of Vitamin D, click here to read my previous article, “What you need to know about Vitamin D”. Arguably the most versatile and proven supplement you can take for your overall health is omega-3 fatty acids (also known as EPA/DHA or simply “fish oil”). According to the National Institute of Health, omega-3 fatty acids reduce pain and swelling from inflammation caused by arthritis. But that is just a small part of what they can do to strengthen your nutritional foundation. Many academic intuitions and researchers have found that supplementing with EPA/DHA may improve brain function, alleviate depression symptoms, normalize and regulate cholesterol triglyceride levels, and reduce the risk of heart disease, heart attack and stroke. It is important to remember that while omega-3s are essential fatty acids and are vitally important for normal growth and development, they cannot be manufactured by the body. You can only get them from what you consume. Since the amount of cold-water fish you would have to eat to get your daily allotment would be considered impossible or highly undesirable to most, supplementation is needed. I recommend a supplement that gives you 1000-1500 mg of combined EPA and DHA daily. Please consult your doctor if you are pregnant, if you are taking blood-thinning medications, or are dealing with any deficiencies in your immune system before supplementing with EPA/DHA. ProOmega, by Nordic Naturals, and EPA/DHA Essentials, by Pure Encapsulations, are some of the best omega-3 supplements on the market because of the high standards they have regarding the sourcing of the fish they get the oil from. The word “probiotic” is a compound of two Greek words — “pro,” which means the promotion of and “biotic,” which means life. This “for life” definition lines up with the USDA definition of a probiotic, which is “any viable microbial dietary supplement that beneficially affects the host.” Many people just know probiotics are something in their yogurt, but they are much more important than that.While “bad” bacteria can cause diseases, an ever-increasing body of scientific research is showing us that regular consumption of “good” bacteria (probiotics) is one the best ways to address a wide array of illnesses and conditions. According to Harvard Medical School, probiotics are immensely helpful in overcoming gastrointestinal concerns such as diarrhea, Crohn’s disease, and irritable bowel syndrome (IBS). Probiotics are also crucial for a healthy, well-functioning digestive tract that is able to effectively and naturally filter out harmful bacteria, toxins, chemicals, and other waste products. If you’ve recently taken antibiotics, probiotics are especially vital since antibiotics kill all bacteria (both good and bad) that reside in your digestive tract. By following up with probiotics, you are able to repopulate your digestive tract with the good bacteria. When choosing a probiotic for yourself, remember to choose a trusted brand, and pick one with at least 15 billion live probiotics per capsule. If you ever feel that you’re lacking the energy you once had, it could be due to a common deficiency in the natural chemical compound Coenzyme Q10 (CoQ10). CoQ10 is involved in the production of adenosine-5-triphosphate (ATP), which is a major energy source for every cell in your body. Much like EPA/DHA, CoQ10 is a very common deficiency since it is hard to get enough of it from the food in your diet alone. Most people don’t enjoy a diet of organ meats like beef heart or liver, which are high in CoQ10. Another similarity between CoQ10 and EPA/DHA is the fact that both are great for heart health (and even work great in tandem for added heart benefits). Dr. Karl Folkers won the American Chemical Society’s most prestigious honor, the Priestley Medal, for his landmark research on CoQ10 that found that heart-disease patients had much lower CoQ10 levels, on average, than their disease-free counterparts. Most of us have known for a while that protein is a good thing, but in recent years whey protein has become a trending dietary supplement. While you can’t always trust the “next big thing” in the diet and supplement world, in this case, the hype is backed-up by substance. Whey protein, according to the Mayo Clinic, can be immensely helpful in maintaining skeletal muscle mass, especially in older people. In younger people, whey protein has a positive impact on exercise-related strength gains and can also increase lean body mass while decreasing fat mass. Most of the benefits of whey protein are tied to its complete amino acid profile, which makes it a very high-quality and easy-to-digest protein source. Whey protein also features numerous antioxidant substances that give it the potential to promote overall health. For example, research published in Alternative Medicine Review found that whey protein has immune system-enhancing properties that make it a possible treatment of the future for cardiovascular diseases and numerous other conditions. A study published in the Journal of the American College of Nutrition found that whey protein is superior to soy protein in a number of ways, namely in increasing lean body mass when combined with regular exercise. Lean body mass is essentially all of a person’s weight that isn’t fat. When we’re young, most of our body is made of muscle. But as we age, that muscle is gradually replaced with fat. It’s important to maintain a high amount of lean body mass as we get older, since it gives our bodies better muscle tone and strength, as well as stronger tendons, bones, and ligaments. When purchasing a protein supplement, make sure you read the label and pick one that features whey. Ideally, get one that includes some whey protein isolate, such as Pure Encapsulations’ WheyBasics, which usually contains a higher amount of protein than other forms and has little to no lactose, fat or carbohydrates, making the protein easier for the body to absorb. Also, check the amount of protein the product contains based on weight. Some products (sold by less-reputable outlets) contain little protein and use chemicals and other ingredients as fillers. It is never too late to start building the foundation of nutrition on which the rest of your life will depend. As we age, we become more susceptible to nutritional gaps in our diet, and these nutritional weak spots can become more readily apparent without the benefit of youth to conceal them. Rather than wait until your doctor tells you that you have been chronically deficient in a vitamin or nutrient for years, a preventative, well-balanced, scientifically-backed diet can ensure that you stay ahead of old age and enjoy a longer, healthier life. I hope this newsletter and the references to my other articles arm you with the knowledge to take positive steps that will extend your longevity and ensure good health from now through your golden years. If you have any questions about the products or suggestions discussed here, or need help placing your order, our customer service team is standing by and ready to assist you in any way they can. You can reach them by phone at (888) 460-3091 or you can email them at: customerservice@oakwaynaturals.com. Until next time, stay healthy! PhytoMulti takes you beyond basic wellness support. 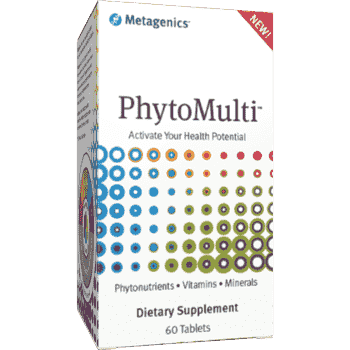 It has a proprietary blend of concentrated extracts and phytonutrients with scientifically tested biological activity to protect your cells and maintain DNA stability activating your health potential like no other supplement. When you were a kid, your mother may have told you, “You are what you eat.” As cliché as it may have been, there is a lot of truth to the saying. Despite what we know through modern science about nutrition, though, many of us still don’t get all the proper nutrients that we need to stay healthy and balanced and keep disease away. This is often due to potential imbalances in our food choices. A study published in Nutrition Journal analyzed men and women over the age of 65 and found that the use of a multivitamin reduced the risk of certain micronutrient deficiencies and also aided in improving cognitive functioning in some of the group’s subsets, including those people past the age of 75. Since multivitamins typically contain ample amounts of B-complex vitamins and vitamin C, studies have shown that daily multivitamin usage can significantly improve energy levels; particularly for those who have vitamins B and C deficiencies. For most people, Metagenics’ PhytoMulti and Pure Encapsulations’ PureGenomics are great, comprehensive choices. Vitamin D is also important because it does a lot more than build healthy bones and is truly not something in which people should be deficient. It is critical for the immune system and for helping fight an array of chronic diseases including cardiovascular disease. According to the Annuls of Epidemiology, supplementing with vitamin D3 has the potential to reduce cancer deaths in America by 75%. Most Americans have lower vitamin D levels than they should, especially in the winter months, and supplementation is necessary for many. Thorne Research’s Vitamin D products, D-5000, D-10,000, and D-25,000 are excellent choices depending on whether you are looking just to maintain your vitamin D levels or build them back up through higher doses; as is Thorne’s Vitamin D/K2 Liquid. According to the National Institute of Health, omega-3 fatty acids (also known as EPA/DHA or simply “fish oil”) reduce pain and swelling from inflammation caused by arthritis. But that is just a small part of what they can do to strengthen your nutritional foundation. Countless academic intuitions and researchers have found that supplementing with EPA/DHA can improve brain function, alleviate depression symptoms, normalize and regulate cholesterol triglyceride levels, and reduce the risk of heart disease, heart attack and stroke. While “bad” bacteria can cause diseases, an ever-increasing body of scientific research is showing us that regular consumption of “good” bacteria (probiotics) is one the best and most important ways to treat and prevent certain illnesses and conditions. According to Harvard Medical School, probiotics are immensely helpful in overcoming gastrointestinal concerns such as diarrhea, Crohn’s disease, and irritable bowel syndrome (IBS). Probiotics are also crucial for a healthy, well-functioning digestive tract that is able to effectively and naturally filter out harmful bacteria, toxins, chemicals, and other waste products. Those looking for high-quality probiotics for general use should consider Metagenics’ UltraFlora IB or Probiotic 50B by Pure Encapsulations. If you ever feel that you’re lacking the energy you once had, it could be due to a common deficiency in the natural chemical compound Coenzyme Q10 (CoQ10). CoQ10 plays a key role in energy production. Research shows that people who exercise excessively are at an increased risk of having low CoQ10 levels, leading to CoQ10 being branded recently as an important athletic performance booster. In addition to boosting energy and fighting heart disease, CoQ10 is also a powerful antioxidant and cholesterol-lowering compound, making it an essential supplement to maintain a strong nutritional foundation as you age. Look for a supplement that gives you 100mg per capsule of ubiquinol CoQ10 like Douglas Labs’ Ubiquinol-QH or CoQnol by Designs for Health. Whey protein, according to the Mayo Clinic, can be immensely helpful in maintaining skeletal muscle mass, especially in older people. In younger people, whey protein has a positive impact on exercise-related strength gains and can also increase lean body mass while decreasing fat mass. Whey protein also features numerous antioxidant substances that give it the potential to prevent disease and promote overall health. For example, research published in Alternative Medicine Review found that whey protein has immune system-enhancing properties that make it a possible treatment of the future for cardiovascular diseases and numerous other conditions. When purchasing a protein supplement, make sure you read the label and pick one that features whey. Ideally, get one that includes some whey protein isolate, such as Metagenics’ UltraBalance Protein, which usually contains a higher amount of protein than other forms and has little to no lactose, fat or carbohydrates, making the protein easier for the body to absorb. Also, check the amount of protein the product contains based on weight. Some products (sold by less-reputable outlets) contain little protein and use chemicals and other ingredients as fillers. It is never too late to start building the foundation of nutrition on which the rest of your life will depend. As we age, we become more susceptible to nutritional gaps in our diet, and these nutritional weak spots can become more readily apparent without the benefit of youth to conceal them. Rather than wait until your doctor tells you that you have been chronically deficient in a vitamin or nutrient for years, a preventative, well-balanced, scientifically-backed diet can ensure that you stay ahead of old age and enjoy a longer, healthier life. I hope this newsletter and the references to my other articles arm you with the knowledge to take positive steps that will extend your longevity and ensure good health from now through your golden years. If you have any questions regarding the concepts discussed here or anything else, please feel free to fill out our Ask the Doctor form found at the Doctors Corner.